Set Up Shop – Your Frequently Asked Questions, Answered! Since I’ve been getting these questions asked of me, well, frequently, I thought it might be easier to answer them for you all, all at once! If your question about Set Up Shop isn’t answered below, please just ask in the comments below! Nope! We’ve had folks from all over the world take the class. I do cover a few topics in the initial housekeeping email where I give links to some Aussie stuff (tax and government registration info), but I also tell you what you need to look into no matter what country you live in. The rest of the course is just as relevant for someone living in Auckland as it is for someone living in New York, or London, or Johannesburg! Do I need to make handmade crafts to do this course – or can I be an artist, designer, etc? I wrote this course specifically for makers – but that goes for artists and designers, as well. If you don’t make your own products, but get them made for you (or sell supplies or vintage! ), there will be a few lessons that aren’t completely relevant to you, but the vast majority of lessons will be applicable to you – stuff like working out your branding, photography, product descriptions, managing your time, marketing, etc. Will you only teach me how to set up an Etsy shop, or does the content work for other platforms too? What I teach in this course can be implemented across any platform. 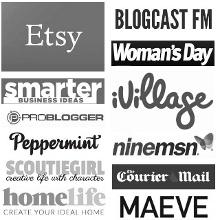 Etsy, Dawanda, Not On The High Street, Madeit, Folksy… or on Shopify, your own website, etc. I do show you how to set up your own WordPress website as an option, but the course is relevant for you no matter what platform you choose to set your shop up on. Do I have to know how to use CSS or html or any other sort of code? Not at all! If you choose to set up shop on Etsy or a similar platform, you’re good to go so long as you can use a computer, browse the internet, and upload stuff. If you can sign up for and take this course, you can set up an online shop! Absolutely! I don’t believe in ‘taking away’ the course content from you. You will have access to it forever – both in the emails you received, and in the form of an ebook, of the entire course at the end. And you also get lifetime membership to the course FB group, so you can pop in there and ask your classmates questions at any time (but I’m only active in there while a course is running). When are you running the course again? I generally run the course twice a year – in March and October. I hope that answered any burning questions you might have about the course! Remember, please don’t hesitate to get in touch via my contact page if you have any other questions!